Nine players registered for the tournament. To make the numbers even, I added 'gnugo3pt8', a build of GNU Go running on one processor of my own Windows system. It is well-behaved. It makes legal moves, and handles the clean-up procedure correctly. It is not strong enough to beat any player that has a chance of winning. 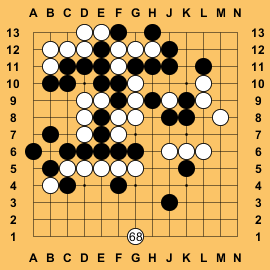 In its round 6 game with gnugo3pt8, AyaMC showed that the middle of a 13×13 board is bigger than the edges, as seen to the right. 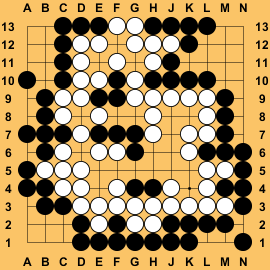 In the round 7 game between ManyFaces1 and StoneGrid, both players passed in the position shown to the left, and marked the dead stones as shown. They then disagreed about the status of some stones, so play resumed. In this clean-up phase, StoneGrid captured two white stones in the top left, but ManyFaces1 did not capture any of the three dead black groups. 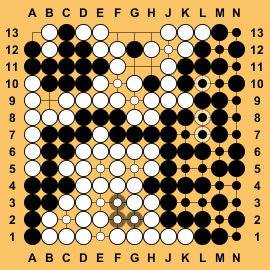 Therefore the game was scored as a win to StoneGrid, although ManyFaces1 coul;d have won by removing the three dead black groups. In round 10, Zen19S lost its only game of the tournament, to ManyFaces1. 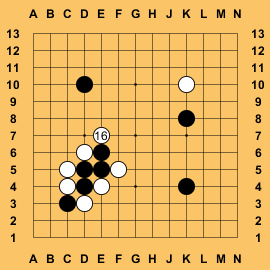 In round 14, Orego12 played the move shown to the right, against stv. This looks so strange that I wonder if it was caused by a bug. In both rounds 14 and 15, AyaMC played StoneGrid. In both games, StoneGrid chased AyaMC's stones in a ladder which was broken by a stone belonging to AyaMC. AyaMC won both games. A position from each game is shown to the left. 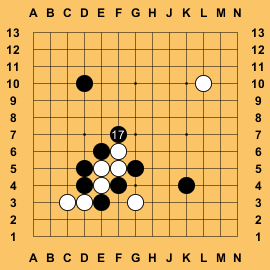 Also in round 15, MCark failed to join its game with Orego12, and lost on time. GNU Go, running on one Intel i5-2500 CPU @ 3.30GHz. nomitan, running on a machine with 2 Xeon 5680 processors (total of 12 cores). pachi, running on an Intel i7-2600 (4 cores, 8 threads) with 16GiB RAM. StoneGrid, running on an Intel Core i7-2600. Steenvreter, maybe running 46 threads each at 2.2 GHz, on a system whose use was generously provided by the Maastricht games and AI group. Zen, running on a mini computer cluster of a dual 6-core Xeon X5680@3.6 GHz 24GB RAM, a 6-core i7 3930K@4.2 GHz 16 GB RAM, a 6-core Xeon W3680@4 GHz 12 GB RAM, and a 4-core i7 920@3.4 GHz 6 GB RAM PC connected via a GbE LAN. 4 PCs (28 cores) total.